Twenty-two years before stardate 2817.6, the governor of Tarsus IV, Kodos, evoked emergency martial law and ordered half of the planet's population executed. His intent was to address a severe food shortage on Tarsus IV, and it earned him the name "Kodos the Executioner." It was believed that Kodos died on the planet, but there is some belief that he may have escaped and assumed another identity. James Kirk, Lt. Kevin Riley, and Dr. Thomas Leighton are the only surviving witnesses to Kodos' previous evil deeds; others who might have known Kodos have been mysteriously killed in various accidents. A traveling theatrical troupe arrives at Planet Q, and a Dr. Leighton contacts the U.S.S. Enterprise regarding a new synthetic food concentrate. When he is beamed aboard, he tells Kirk that his real reason for contacting him was to tell the captain that he suspects Anton Karidian, the head actor in the theater troupe, is really Kodos. 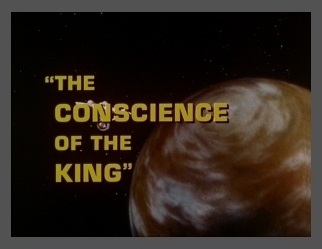 When Dr. Leighton is murdered, Kirk agrees to transport the Karidian Players to the Benecia Colony on board the U.S.S. Enterprise. His real motive is to study Karidian and his daughter in an attempt to learn if he is, indeed, Kodos and responsible for Leighton's death. When Riley is poisoned, the young man learns of Kirk's suspicions and goes to the theater on board the U.S.S. Enterprise to kill Kodos. Kirk stops him and takes the actor as his prisoner. Then he learns that Karidian's daughter, Lenore, has been killing anyone who might know of her father's past life. Karidian, who has been trying to forget his past, is horrified to find what his daughter has been doing. Lenore aims a phaser at Kirk, but her father steps into the line of fire and is killed. Lenore goes completely insane at having killed her father. Since when did the 'T' word bother Kirk? Sorry, a bit of goofyness there. Spock doing a bit of math!